Unpacked telescope from case and found moisture! Damn, it's true. The telescope should be stored with slight heat. I dried everything out in the hot sun. I setup the tripod and mount in the afternoon. Took my time. Then I aligned the polar axis around 10pm. I think I'm finally figuring this out... I was worried that the point I chose would not work for Saturn and Jupiter--turned out to be true. From 2300h to 0200h in Union, Ontario, I tried to find Uranus. No luck. Was very frustrated (partly with the finder scope angle). Maybe too close to the horizon, not a very dark night, with a lot of humidity. The kids showed up at 1am. Mom joined in. I showed 'em the Andromeda galaxy, the Ring Nebula. Then I moved the 'scope so to view Jupiter, Saturn, and the Pleiades. The kids really enjoyed that. At first I questioned their motivation and true interest but they warmed up. The Red Spot was supposed to be visible but I couldn't see it. Used my new dew heater (purchased at Efston Science). It worked very well, despite very heavy dew! No moisture on the corrector. I successfully ran the heater below Medium setting. I also used the portable battery. It too worked well, with no appreciable drain on the battery! At first I was going to build my own portable power source after reading and printing some articles from the net. But as I went shopping at Canadian Tire for car and marine batteries, I chanced upon a purpose-built portable car battery. 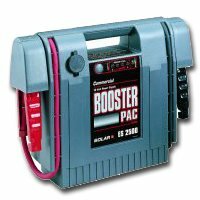 The Century Booster Pac was designed for boosting a car (which would be handy, of course). But it also included a Cigarette Lighter Adapter socket. Perfect! Mine is just like this except yellow. I continue to consider selling the telescope. If I sold it I might get $500 or $1000 for it. Selling it would get me some cash. I don't use it that much, not as much as I want. When I don't I feel guilty. So I went for Messier 57 (M57), the Ring Nebula. And I found it! I had the telescope well aligned. Initially, Lisa aligned it to magnetic north (with my old finicky compass). I remembered this evening to set the latitude of the mount for Awenda (45° 40'). Then I ballparked Polaris through the mount scope. Then I locked into a nearby star in Lyra and looked up the coordinates in my Epoch 2000 atlas (it was very accurate, within ½ a degree). Then I realigned to M57. Fine tuned with the axis controls and saw a faint greyish ring-like smudge. Very faint. I showed the kids (and adults). Steve could see it. We tried a bit later and as it darkened it improved slightly in definition. Later again it was fainter--perhaps due to moonglow (nearly full) and dew. Lisa whispered I should go for something easier to see for the benefit of the younger kids. Good idea. So I tried to reel in Messier 51 (M51), the Whirlpool, and then M101/102 (Messier 101, Messier 102), to no avail. One of the kids said, "What about that?" pointed to Arcturus, in Boötes. I said stars are boring through the 'scope but we went for it and enjoyed the yellow colour. The double-stars was mentioned and I knew there was a good one in Ursa Major—somewhere. Melissa or Heidi was describing it to one of the boys, I eavesdropped, and followed her directions to the second star in from the end of the handle (of the Big Dipper). A nice double star. Steve called it "sweet." Need a step-stool for kids! Something collapsible? Lots of dew! My camera and papers were soaked! Lisa and I watched the zenith sky lying on our backs on the benches. It was very nice. The telescope was silhouetted against the sky—handsome. We saw the moon rise through the trees..
Later, Lisa and I drove to Kettle's Lake—probably around 10:30. Luna was glorious over the lake. Incredible indigos and midnight blues! Mist rising, turning to fog. Loons haunted us. Hil and Pam dropped by (after arriving too late at the beach lookout). Ferocious mosquitos. Lisa was very happy to watch the colourful sunset and see the near-full moon rise. The intent was to get up really early, 3:30am, to see Uranus, Neptune, more importantly, the Perseids. But the Psion palmtop batteries died at 1:30am and I forgot to replace them. I woke at 5am and arrived Kettle's Lake around 5:30am. Didn't see any meteors... Damn. As it was I saw a red star (intially mistook for Mars, unspectacular), Saturn in her glory, and Jupiter and the big moons. Callisto and Ganymede were well left and right of Jupiter, but Io and Europa were almost in conjunction. Without my Psion Procyon software I might have mistake them as one. There's lots of dew! So its not just an evening factor. And there are a lot of mosquitos. Must wear Muskol on these occasions! Waiting for Mercury. Mars is close to Mercury too. Treeline might be blocking it. Couldn't find 'em. The telescope legs are waxed. Felt a little easier to set up. Brought my magnetic compass to help me find north... Also remembered to carry extra ½" socket wrench for tightening/loosening tripod legs. These little things made the experience a bit better. Fine tuning... Not great observing but good to commune with nature in the sunrise. Lots of interesting sounds! Chipmunks and sparrows playing. It's going to be a spectacular day. Tried to buy Fujicolor SuperG+ 400 ASA print film at Wilkie's on Bloor West. This film is recommended by Dickinson in his astrophotography book Splendors of the Universe. But Wilkie's said it has been replaced by Superia... So, I bought some of that.